Stephanie Laurens on the Launch of the Black Cobra Quartet! Just tell us what you like about the video via the comments section of this post. Include the first part of your email address with your comment. You need to be a NOR newsletter subscriber to enter. That's how we get your full email address...so you don't have to post it all on the comment. 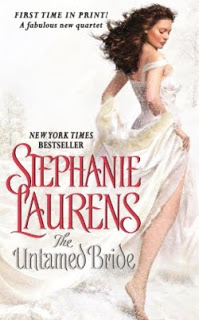 On October 27, 2009, Stephanie Laurens will be unveiling a bold new series, The Black Cobra Quartet, which launches with THE UNTAMED BRIDE (on-sale from Avon Books). The novels sweep us from colonial India to the marble-lined halls of London's most posh hotels to the rarified rooms of Southampton country estates, as the leading men, officers of the East India Company, battle a deadly foe with insidious plans against Crown and Colony. Reader interest was piqued when told the series "both fits in and stands out from" Stephanie Laurens' previous works. SL: It fits in because in the background many couples from previous books, both heroes and heroines, get to play active roles, and yet the quartet is a distinct collection of four novels, with a single new and unusual story connecting the four, plus four new heroes and heroines not glimpsed before. In addition, the Black Cobra Quartet commences in India, and the plot calls for the four heroes to leave Bombay and make their way, more or less under attack the entire time from the villain and his forces, to England and the Duke of Wolverstone. We therefore have four Regency road trips/pursuits, but while all end in England, the journeys described are widely different, and cover half the globe. So THE UNTAMED BRIDE and the three following volumes are very much "familiar but different" - something fresh to pique readers' interests and imaginations.